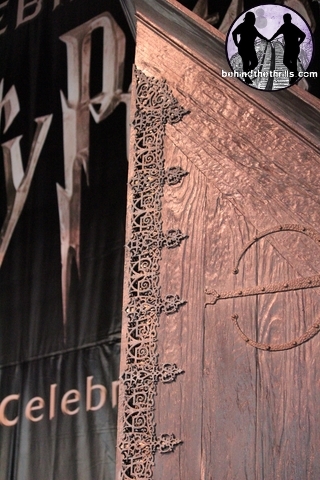 A Celebration of Harry Potter at Universal Orlando was all about bringing the fans closer to the series than ever before. 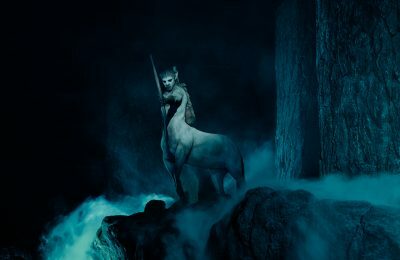 Most of that, however, focused on what the films or books have brought to everyone. One presentation, however, brought the fans closer to the world that allows the books and films to live on, with a behind the scenes look at what it takes to make the Wizarding World leap from the screen and into real life. 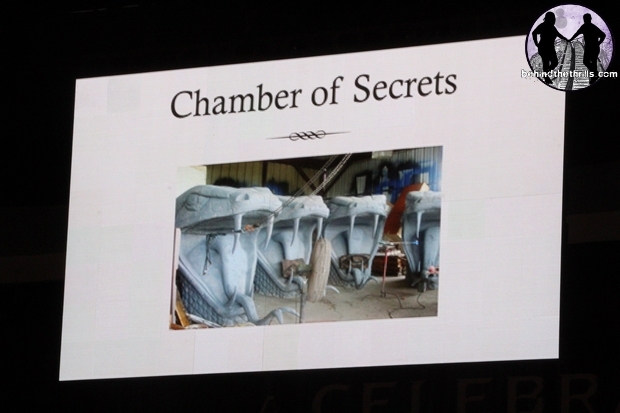 The presentation also gave fans a first look at some of the props that will be making their way into the newest expansion-Diagon Alley this summer. 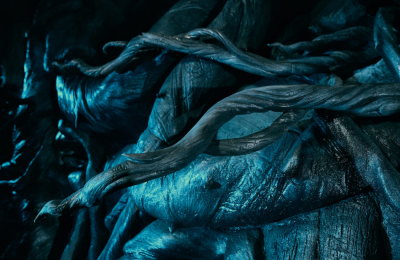 Art director Alan Gilmore, Harry Potter film sculptor Bryn Court, and Senior Prop Manager at Universal Studios Creative Eric Baker took a crowd full of fans on a journey that took them several years to accomplish, all in about 45 minutes. Through slides and stories, the three told fans about the painstaking design process of designing everything that would go into the films, and ultimately the theme park attractions. 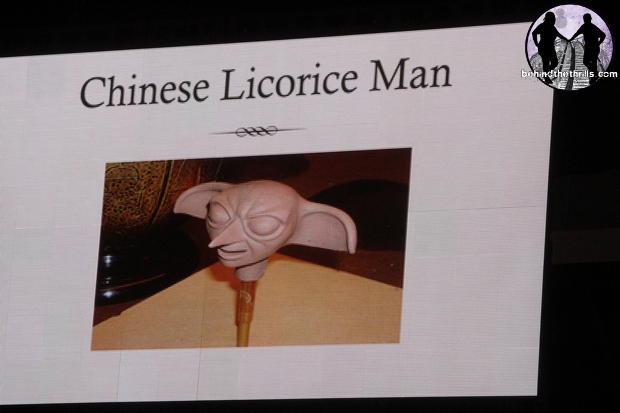 Props that guests may only take a brief moment to look at, such as the Chinese Licorice Man, featured prominently in Honeydukes Sweet Shop, took months of sculpting and labor to get just right. For instance, while the snake heads used in the film version of Chamber of Secrets were crafted on set, and could fit in with the huge scope of a soundstage, the same types of head were sculpted in Orlando and would have only inches to fit into the respective places in the attraction. Everything, however, is there. Even things that most guests may not notice, are there. 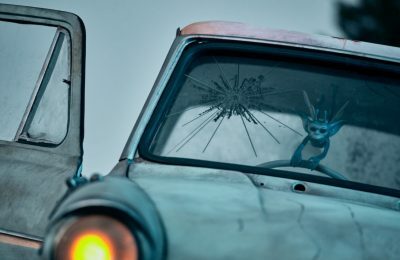 It’s the little details that make the entire world come to life at Universal Orlando, and something that the filmmakers wanted to bring from the flat two dimensional world of the screen. Little details go a long way in Hogsmeade, and they certainly will at Diagon Alley as well. To show off a little of the detail going into Diagon Alley, the crew brought out some of the props that will be seen in the new area. 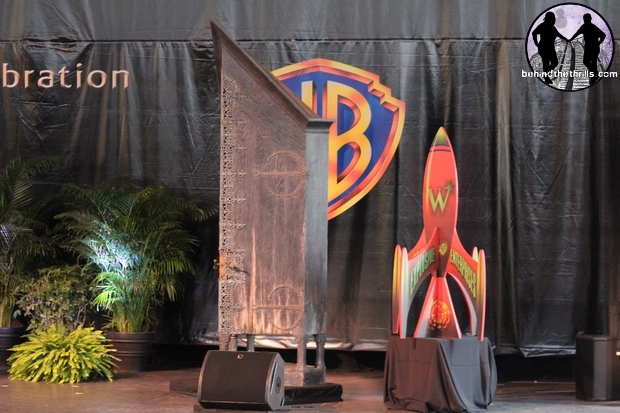 The Weasley’s Rocket will be featured prominently in Weasley’s Wizarding Weezes, while the Vanishing Cabinet will be featured in Bourgin and Burkes. 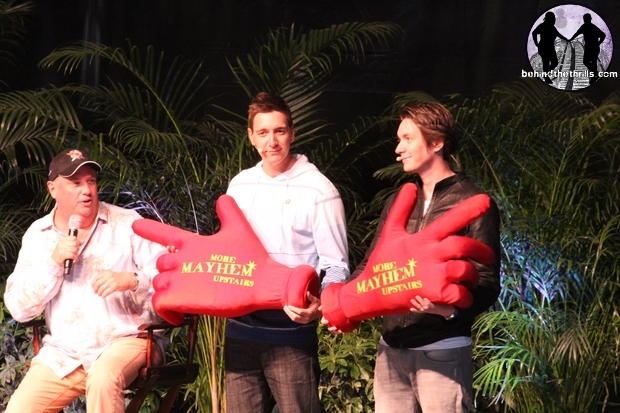 To demonstrate how much detail is going into the new area, Oliver and James Phelps came out with two props that will go into the store. While the originals in the films were actually made of foam, the signs in the store will be made to last a bit longer. The level of detail in the props are amazing. We had one of the many talented team members point out a little bit of detail to us that we would have passed along. 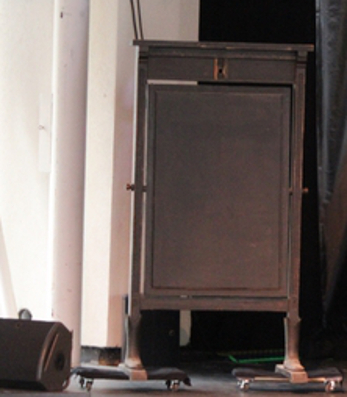 If you look past the filigree on the door, you’ll see hundreds of little gears and cogs that make up the cabinet. 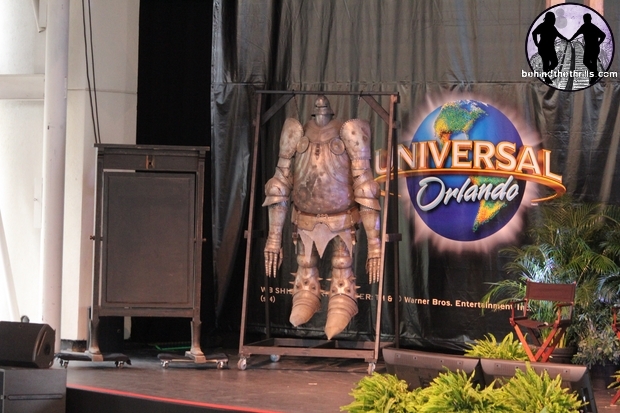 This suit of Troll Armor is actual armor hammered by a blacksmith, and will be featured in the blacksmith shop in Diagon Alley. This blackboard is the one used in the film in the Dark Arts classroom. It will be switched out on the Forbidden Journey queue, making the experience more authentic. 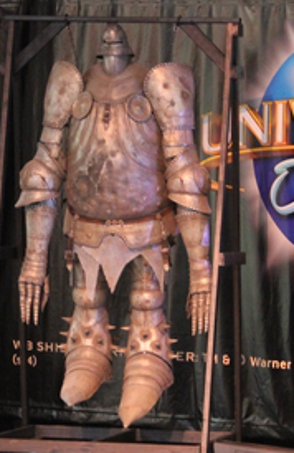 While several pieces of the attraction were replicated just for the attraction, several more are actual props from the film series. See and learn more about what it takes to bring the world of Harry Potter to life in theme parks by watching the entire presentation. Stay tuned as we learn more about Diagon Alley in the coming weeks. Be sure to follow along on Twitter @BehindThrills for the latest updates. For more information about The Wizarding World of Harry Potter at Universal Orlando, visit the officila website by clicking here!